So here’s the back story. I maintained these web applications which generated Adobe PDF report files, which were designed using Crystal Reports in Visual Studio. 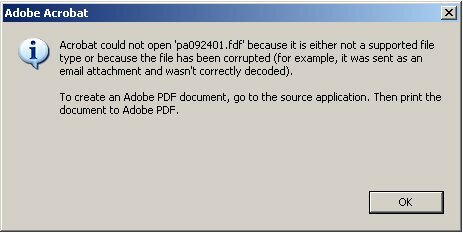 The reports were generated on the fly, and there were no problems from my users… Until one of them said she couldn’t see the PDF file. She only said there’s an error. This was where my user querying skills came into play, and I finally convinced her to send me a screenshot of the error (it was fortunate I didn’t have to teach her how to use the PrintScreen button…). And the solution? Fire up the Microsoft Internet Explorer (IE) browser. In the browser, click on “Tools” menu, then “Internet Options”. On the “General” tab, click on “Settings” button in the Browsing history section. If you’re using IE6, then it’s under Temporary Internet files section. Make sure the radio button under “Check for newer versions of stored pages” is checked at “Automatic”. The user with the error probably set it at “Every time I visit the webpage”. Note that my users are in an internal corporate network, so the only browser they know and use is IE. I’m not sure if this happens on other browsers. I’m writing this because it took me a long time before I finally found the answer. That answer was probably here (yes, mjurrius, it helped. Thanks! ).